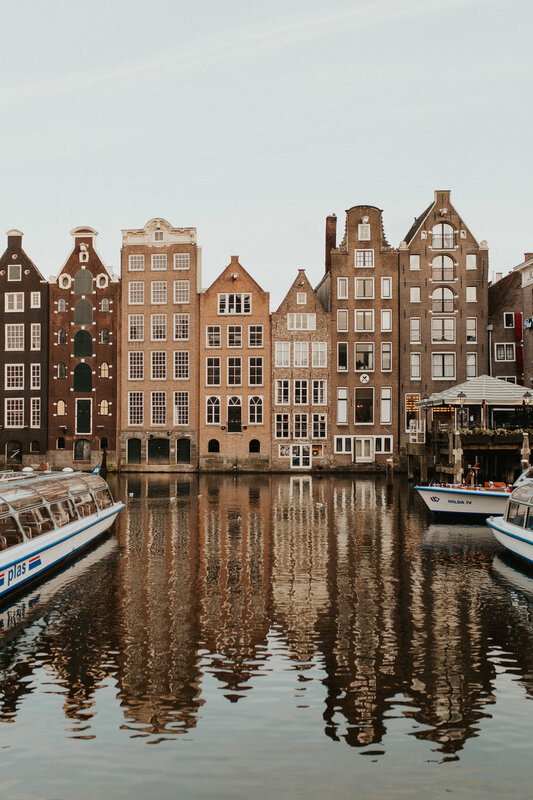 Amsterdam is sincerely one of my very favorite cities to visit (I actually think every place I write about it “one of my favorites” but whatever! I have many loves). My first time in AMS I wrote this in the back of my bible and I would like to share that with you. to the bells and pedals of the bikers, and feeling the crisp Netherlands air bite at my ankles. All while the breeze blows my hair onto my flushed cheeks. Soaking every tiny detail of this gloriously simple moment in. free. Not a person. Not a place. You can totally do Amsterdam in a weekend, but if you have more time I would recommend booking longer here. After you do all of the touristy things such as the inevitable Red Light district (It is fascinating) and the Heineken factory the things to come are my Top 3 “Musts”. Anne Frank House. You can’t go to AMS and not go here. Its humbling and really quiets your spirit. The true markings on the wallpaper from where they measured the kids will make the hair on your arms stand upright. The creeky floorboards send your stomach into a summersault when you realize people fighting for their lives called them home. The line is almost always 2 hours long, unless you are waiting in the rain. It is well worth the wait. 9 Streets Shopping District. Some of the best shopping in the city and to me it is one of the best Amsterdam experiences out there. You are enveloped between tilting brick structures and twinkling canals. When you are walking around here you just simply can’t help but feel so in Amsterdam. Not to mention some of the best coffee shops (for coffee) reside here. The Fault in Our Stars bench. K you caught me. The real reason I ever went to AMS in the first place was inspired by this book/movie and I am a fan girl so BYE. But, I fell in love with it so much I have been 3 times since. Either way the scene from this bench is my favorite in the city. On every corner within a two block radius has a bench to sit and watch the Dutch world go by. There is simply nothing like it. I have met with God many times in this place, and the beauty and realness of life. Please just go, it’s so beyond beautiful. Find the corner of Leidsegracht and Keizersgracht and you are there. Enjoy. the flower market. Hundreds of tulips call this place home waiting to be purchased. The flower vendors line the canal, and it is just spectacular. Central Station (and the area surrounding). Just breath taking. My favorite restaurant is called Restaurant Pastini. Inside is like a tiny European Heaven. So packed together and intimate. Get the green bean French fries. Located near the bench. Another favorite place to eat is The Avocado Show. Everything on the menu incorporates the words greatest food: Avo. A great coffee shop to venture to, near the Avacado Show is Coffee And Coconuts. The vibe in here is to-die-for. Tropical themed and delicious. You can also order food here. Keep in mind this is a place for coffee not weed. In Ams coffee shops are also known as weed shops. So be careful. or don’t. teehee. One final place to eat would be Burgerlijk. Like no burger you will get in the states. It is fresh and dripping with delight. Make sure to get the Amsterdam culture fries with mayo and enjoy while you walk about the city. As always please reach out to me if you need any more tips on this glorious place.